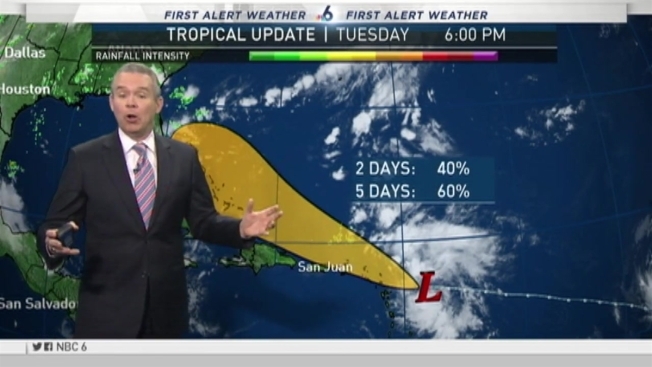 Forecasters across South Florida continue to watch a tropical wave in the Atlantic that could impact our area within the next few days. As of Tuesday morning, it is situated east of the Leeward Islands and produced a bit more thunderstorm activity overnight. The National Hurricane Center has given it a 60 percent chance of developing into a named storm. While the environment hasn’t been conducive for development, the system will now enter a more favorable atmosphere. This has proven to be a tricky system to get a handle on over the last several days. The most reliable computer models have not handled it well, nor come to any agreement what the outcome might be. A Hurricane Hunter aircraft flew into the wave Tuesday, and found it remains disorganized. It was moving west-northwest at 15 mph but could strengthen later in the week. Another Hurricane Hunter is scheduled to investigate the disturbance Wednesday. Meanwhile, Tropical Storm Gaston was still strengthening, while moving quickly west-northwest. The storm had maximum sustained winds at 65 mph as of the 11 a.m. advisory. The storm's maximum sustained winds had increased early Tuesday to near 50 mph. The U.S. National Hurricane Center says additional strengthening is forecast and Gaston is expected to become a hurricane by Wednesday. Gaston is centered about 545 miles west of the southernmost Cabo Verde Islands and is moving west-northwest near 20 mph. Elsewhere in the Atlantic, Fiona was finished, according to the 11 a.m. advisory by the National Hurricane Center, saying it was the last advisory they would issue for the storm. Post-Tropical storm Fiona was moving west-northwest at 12 mph with maximum sustained winds at 30 mph.